Food at The Greek Larder: made for sharing. 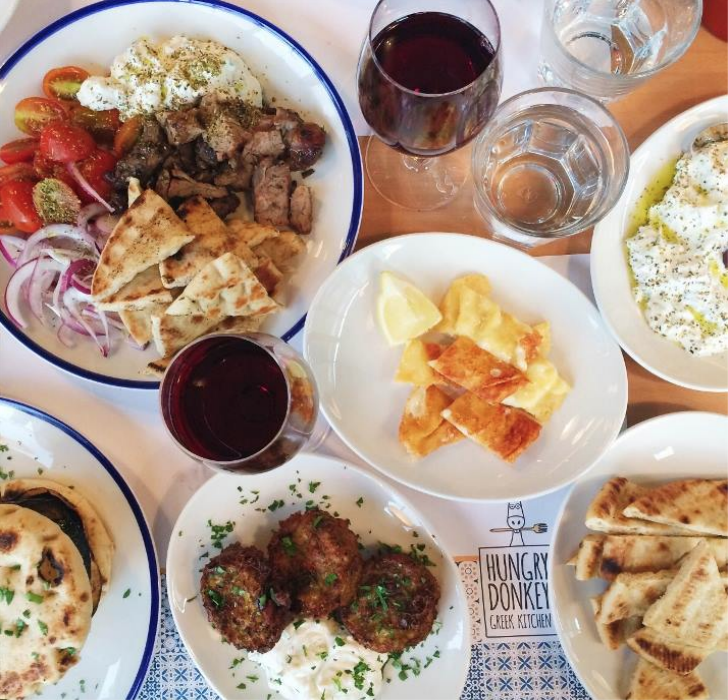 For years, Londoners have struggled to find decent Greek restaurants. 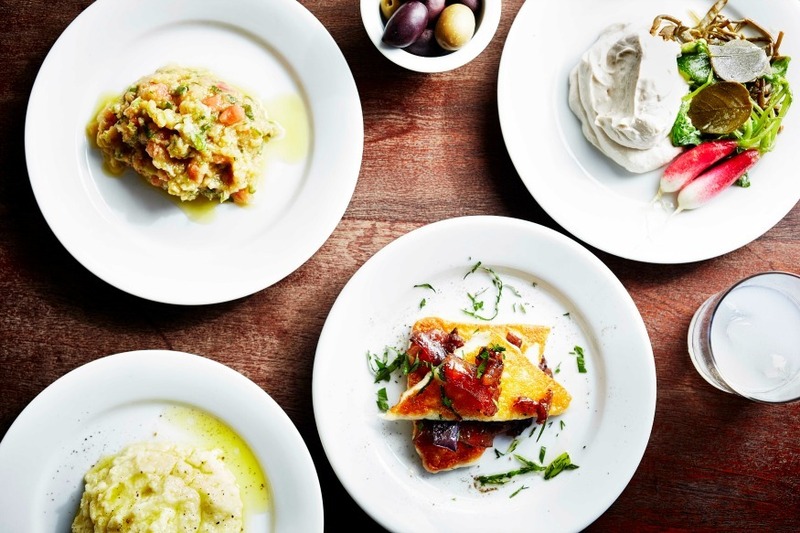 North London is home to many popular Cypriot restaurants but menus rarely extend beyond the usual offerings of halloumi (a Cypriot, not Greek, cheese as is often assumed), salads and basic grilled meats. But why have things changed in recent years? Panayis Manuelides, the owner of Odysea, a Greek food importer, explains "after the second world war and during the 60s, many Cypriots came to London to get work, which was easy for them because Cyprus was part of the Commonwealth. Greeks at that time migrated mostly to Australia and the USA. Therefore, most Greek restaurants in the UK were Greek Cypriot restaurants. "These days, because of the economic crisis in Greece, many Greek people are coming to the UK to open restaurants. We'll be seeing a lot more opening in the next few years. We will also start seeing more Greek food products making an appearance in the UK as Greek people are driven to the fields and farms in order to make a living." So London may be on the verge of a Greek restaurant boom, but where is good to eat Greek food right now? There's a major trend for souvlaki (see our handy guide to the best here) but what about restaurants? No smashing plates, please. The Greek Larder. Theodore Kyriakou is the man behind The Greek Larder (he was also the man behind The Real Greek back when it wasn’t a chain), a bright, modern space that lights up a corner of the somewhat soulless patch of the King's Cross area. 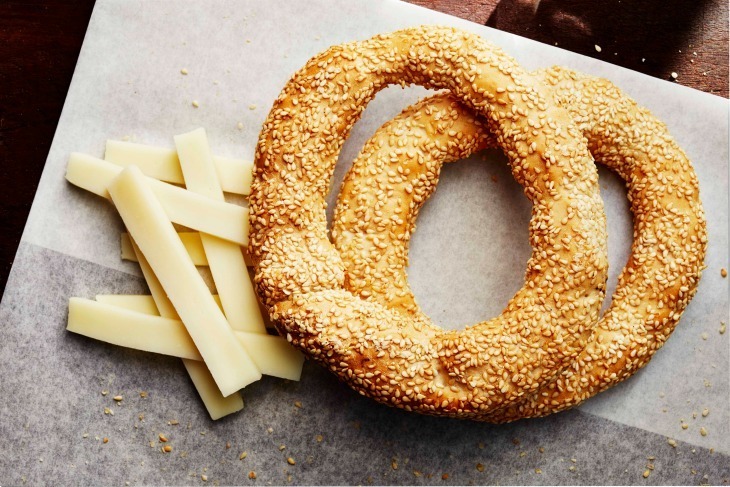 Everything we've tried has been excellent, including the breakfast which features kollyva (like a Greek granola made with yoghurt, honey, pistachios, preserved apricots and mint) and koulouri (a beautiful sesame-speckled bread) served with sharp cheese. "People can't believe I serve the kollyva" Kyriakou says, "it's a dish traditionally served for the departed, but it's delicious!" Koulouri at The Greek Larder. Kyriakou is very particular about sourcing ingredients, importing un-waxed fruit from Greece, such as apples for juicing. "The fruit is very sweet in Greece" he says, "and also it means I am supporting the struggling economy." His chefs also make one of the best souvlaki in London, with a menu full of classic dishes given a modern twist. 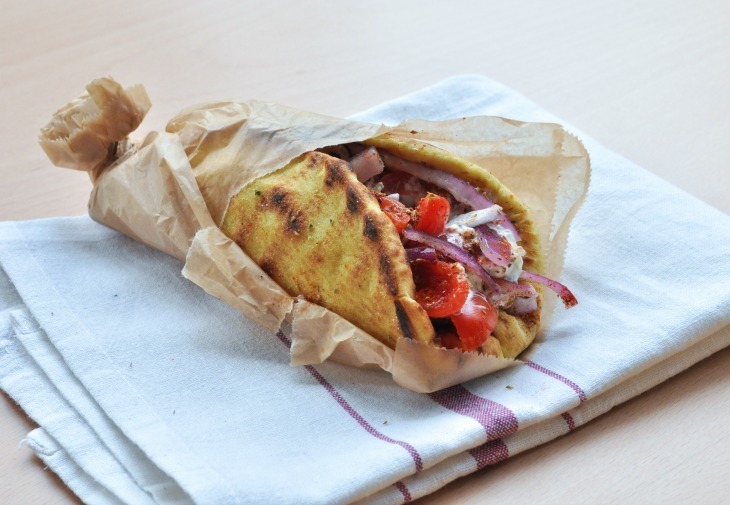 There is a focus on seasonal ingredients with dishes changing throughout the year, for example in the summer the souvlaki contains fresh tomatoes, and in winter, a rich tomato sauce. The Life Goddess began as a deli and café space in Bloomsbury in 2012, before opening a second site in Soho, which is more of a restaurant. It was opened by two brothers, who became frustrated when looking at French and Italian delis in London, and thought, why is there nowhere like this for Greek food? 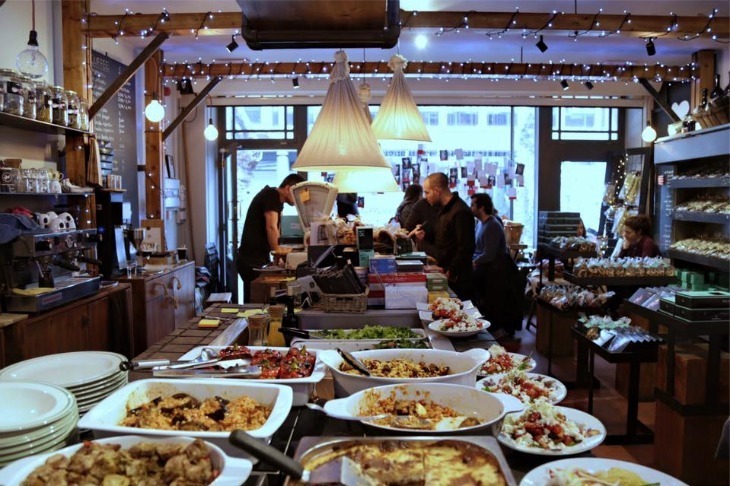 One of the founders, George Nyfoudis tells Londonist, "We came over at the beginning of the crisis and it was so hard to get a place, doors were shut in our faces. No-one wanted to even talk to us, but then we found the Bloomsbury site, and they were friendly." The Soho branch offers an a la carte menu of traditional Greek dishes and there's also a range of cocktails incorporating traditional Greek spirits like masticha. Just off Petticoat Lane this bright, modern Greek restaurant has a focus on street food. They're careful about sourcing, and meat comes from farms in Cornwall and Devon to be cooked on a robata grill. Markos Tsimikalis created Hungry Donkey "to try to blow a breath of fresh air into the life of the traditional Greek food offering in London." He tells us, "we wanted a restaurant that on the one hand honoured the roots of Greek cuisine which are based on simplicity, fresh ingredients and an authentic made-by-your-grandmother feel, and on the other hand, paid homage to the creative explosion of cutting-edge Greek modern design which has been sweeping the hospitality industry in Greece over recent years." A tempting spread at Hungry Donkey. Photo: Hungry Donkey/Facebook. There may not be many good Greek restaurants in London just yet, but there is a major street food trend in the form of Souvlaki. We’ve made a list of the best in London, with a handy map. 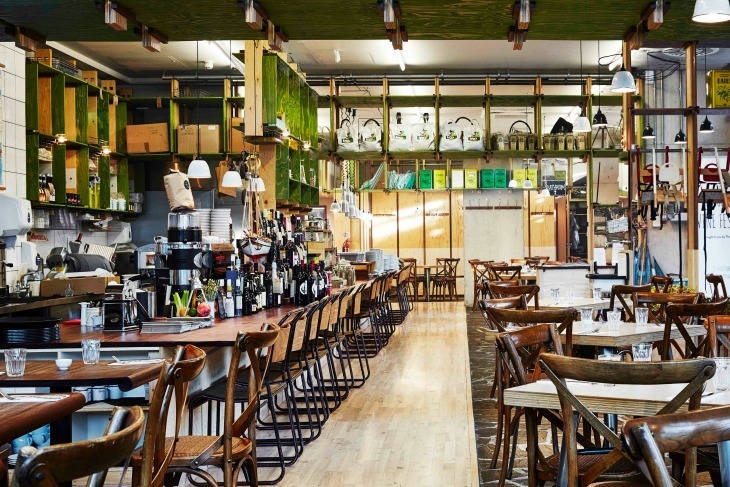 Peckham Bazaar: This south London restaurant takes inspiration from across the Balkans but the Greek influences are definitely there. We love their octopus and white tarama dishes. Opso: Mixed reviews rolled in for this Greek restaurant but we’ve heard good things about their cakes.